How important is Original Content? So, I’ve been blogging for about three years, now. And I’m pretty committed to it. Three posts a week, rain or shine. Sometimes I take some time off, for a vacation, but most of the time, Monday, Wednesday, Friday, here I am. It’s a challenge to come up with original content three times a week. Honestly, there are some days when I get up and I think I got nothin’. The well is dry. No inspiration, no ideas. But I’m serious about posting three times a week, so I write something. Sometimes, when I’m devoid of inspiration, I turn to other blogs for help. Often, I’ll write a post that riffs off of another post someone else wrote. I figure either my audience maybe isn’t familiar with that blogger, or if they say something really interesting that sparked me, that others might find it interesting, too. But I always try to put my own original spin on it. I’m noticing more and more these days, blogs that are built entirely on other people’s content. There is a new application called paper.li that allows you to create a “dailly newspaper” from the tweets and blogs of people that you follow. Could be a useful aggregator application that you could share with your followers, right? But there’s just something about it that doesn’t feel right to me (and I should not complain, because my stuff gets picked up by people who are creating these papers all the time). So, here’s my question to you: when you are reading a blog, how important to you is oringial content? Do you care if it’s original or are you just looking for value? I’m really interested to hear what you have to say. I agree with Brian. I value the bloggers, tweeps, etc. who have something to say AND can share at the same time. If you’re only sharing, it kind of seems lazy to me. I think the best balance/example of original content is the women of a new(ish) literary arts magazine: Paper Darts (http://www.paperdarts.org/). Their blog is largely “curated” with design and inspiration from other artists. But they often explain their rationale for choosing to share. The provide context. It’s not enough for them to say “check out this illustrator.” There’s an effort involved, and I appreciate that. Concerning theatre topics and such. It is quite interesting when a variety of people chime in from a #2amt topic and have a sort of conversation between blog posts. It provides a nice pool of voices, and I don’t mind when people riff on other ideas. I too an not a fan of strictly aggregating other people’s content. What really interests me is the person behind the ideas. So I love being introduced to something but when I’m reading someone’s blog it’s because I appreciate their perspective. 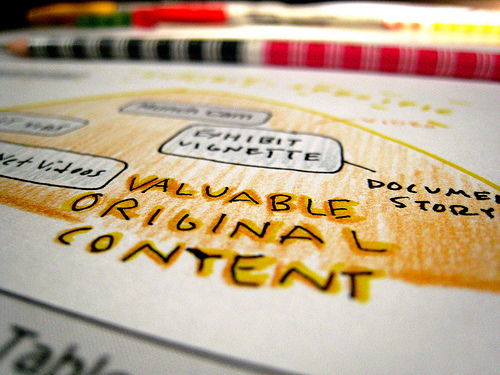 Original content is everything on a blog. Other people’s content is for Facebook. I appreciate original content but I read blogs for a number of different reasons. They have to be interesting to me, or it’s just a painful slog trying to read them for information, but the information’s the reason I’m there. Therefore an informational riff is welcome (w credit) but it’s the personality of the blogger that keeps me coming back. I would definitely read a blog that was entirely curated content. But I think it would have to be very tightly focused. The various paper.li versions I have read tend to meander into uninteresting (to me) territory. I confess I would miss the personal spin or curatorial rationale; but if the content was compelling I would stick with it. I am currently exploring the notion of using paper.li for group curated content for an organization/client for whom I am the Director of Membership Services and Communications. It would be an interesting experiment at the very least. I like a mixture of both. Using someone else’s blog to riff off of is like jazz, but it doesn’t sound as great unless you add your own notes. I love that analogy, Meesh! I’m really concerned with my SEO (as well as catering for my readership of course!) and as such the need for original content is massive. Like you I’m happy to be inspired by something someone else has written, but it always goes through my own internal filters before I put fingers to keys.